Pulse is delighted to present insights into the types of discussion that you can expect to be part of at a Pulse event. This Pulse Report is based on the output from our recent Talk to the Board conference, hosted in London. A panel of board directors, who between them fulfil management roles of CEO, CMO, CIO and Chairman, Non-Executive Director, responded to questions from an audience of CISOs and senior cybersecurity practitioners. The room of over 70 cybersecurity leaders did not hold back! Thanks goes out to all participating speakers, guests and sponsors for being so open and honest, which made for such a stimulating discussion. We can’t wait for ’round two’ of Talk to the Board on 7 November 2019! 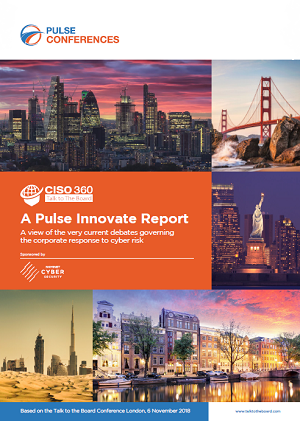 We hope that you will enjoy the reading and find valuable insights and tools to help you in your role and the cyber risk posture of your organisation.